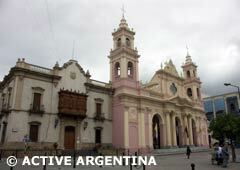 The Cathedral of Salta is one of the most important buildings in the city. Get all the details of its history, its architecture, its images and monuments. 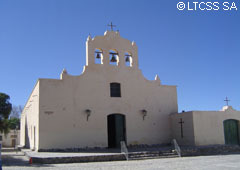 On the first day of the foundation of Salta, the building sites for the construction of the main buildings were appointed, including the so-called “Main Church”; the parish house was built on the apple to the north of the square. The current church is the result of three other constructions. The first one must have been a very simple one, as the style of the constructions of those times was and as it corresponded to the colonial situation. It must have had adobe walls and a few windows. It did not have bells nor important figures. Since the construction was very simple, this first building started to break quickly; therefore, the construction of the second one started almost in the same place. 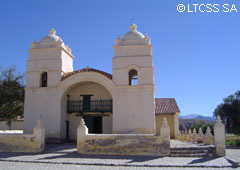 According to what the people from those times stated, it is known that this second church had two towers and a dome in the center. 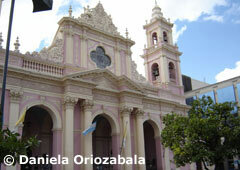 This second building was the one that survived the earthquake on September 13th, 1692, a very important date in the history of our Lord and of the Virgen del Milagro (Virgin of the miracle). The earthquake movements made one image of the virgin fall but it didn’t break, this image was the one of the Immaculate Conception that was placed in one of the towers. This fact was interpreted as a first sign of “a secret warning from God”. In those times the Jesuit fathers remembered that there was an image of the Holy Christ that had been kept in the vestry for more than a hundred years without having ever been exposed. At that time, the image was placed in front of the church that the Company of Jesus had in the city center, in front of the main square and only a few meters from the image of the virgin that had escaped the earthquake. 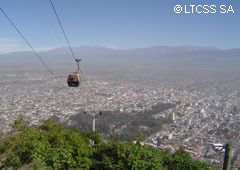 From there on, the earthquakes ceased and the people from Salta renew every year in the patron’s festivities on September 15th the faith displays towards the Lord and the Miracle Virgin. 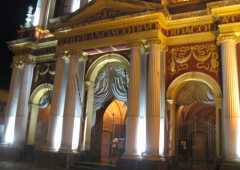 The current church started to be built in 1858 and it was finished after several inconveniences in 1883. This church’s architectonic style is neocolonial, of the Italian current and it has a rectangle floor with three naves, a presbytery and a semicircular apse in the high altar. The transept is very high, with a central dome. The side aisles have stained glass windows to let light in. The style of the access door is baroque. The image of crucified Christ (Lord of Miracles) is worshiped and there is the ‘Panteón de las Glorias del Norte’, a place where the remains of Martín Miguel de Güemes, Álvarez de Arenales and Rudesindo Alvarado are still kept.